SM Malls in Bulacan, recently held significant events dedicated to the Elderly and Person with Disabilities, through respective events namely “Livelihood Mentoring” Seniors Day at the Mall and Caring for Customers with Special Needs, a PWD seminar. 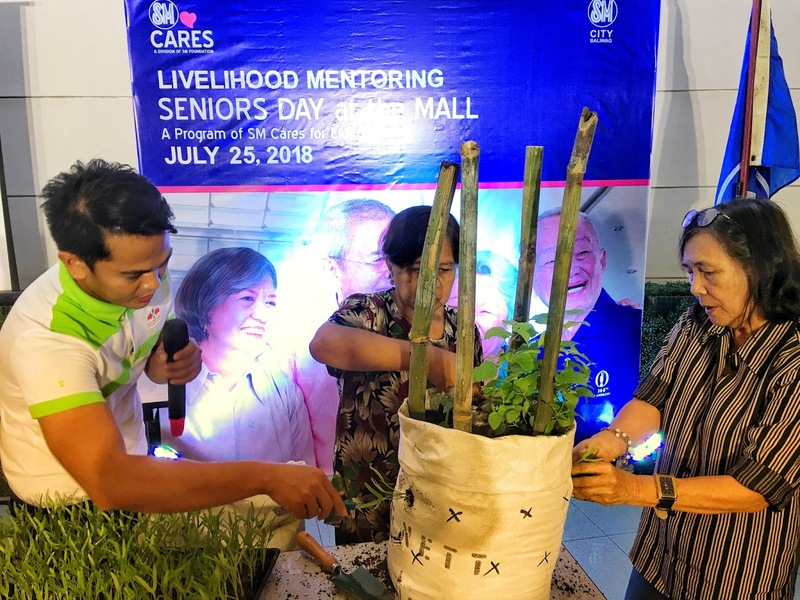 Seniors Day at the Mall contributed enriching training and new learnings for the Senior Citizens as SM Malls in Baliwag and Pulilan in partnership with East-West Seed Philippines demonstrated Livelihood Mentoring through Urban Gardening. The three-hour program was mainly focused on teaching seniors the easy and practical technique in vegetable planting through a limited space, and untypical areas such as on rooftops, alleyways, sidewalks or any little space available. Urban Gardening is one way of promoting a fruitful activity among senior citizens without having to endure the long hours of traveling to farm and braving the unpredictable weather, considering their age. During the mentoring, the elderlies got involve into actual planting, using recycled sacks and empty plastic container as basin for plants. Above all, SM Bulacan Malls hope the program will be beneficial for seniors who may utilize their knowledge in urban planting to develop a healthy lifestyle through healthy food consumption or make a livelihood out of selling vegetables. Through such activity, it is expected that the seniors will develop more strength, motivation and quality time to spend with other seniors who share the same interest. Moreover, SM City Baliwag instill the importance of caring for Persons with Disabilities through Caring for Customers with Special Needs, a PWD seminar with more than 100 participants including SM mall agencies, tenants, affiliates and mall admin employees participating in the event. The seminar was composed of lectures such as Type of Disabilities Discussion delivered Ms. Rubiriza Cruz, SPED Teacher from Baliwag North Central School as well as Basic Sign Language Teaching by Ms. Zenaida Guevarra of AKAPIN, an organization of parents and volunteers for persons with disability. PWD seminar takes a bigger part in strengthening SM Malls’ role in providing quality service to Persons with Special Needs through proper knowledge and understanding of such condition, more so, to promote respect to persons with disability in order to recognize disability rights and inclusion. SM malls continue to provide friendly facilities to PWDs, including facilities like PWD ramps at the mall entrance, exit, main street to arcaded sidewalk; comfort rooms, parking lots; lowered counter/priority lane; PWD slots inside the cinema; fitting rooms, ATM or Automatic Teller Machines and directional and information signages within the common areas. The Seniors Day at the Mall and Caring for Customers with Special Needs is spearheaded by SM Cares, a division of SM Foundation.